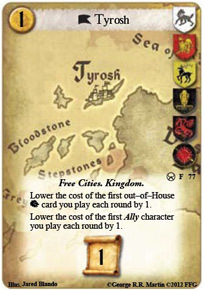 Lower the cost of the first out-of-House [Lannister] card you play each round by 1. Lower the cost of the first Ally character you play each round by 1. Excluding Shadow crested cards, and the banned Jaqen, there's 37 Lannister Ally characters. Use the characters who are also a Knight in Knight decks, or the assorted gold producing characters. I don't think I'd ever do it, but if you are playing a non-Lannister deck that is hard up for lots of gold you could always use Tyrosh to 'normalize' cost of Lannisport Councilor (RotO) Lannisport Moneylender (LotR) Lannisport Steward (Core) or Lannisport Weaponsmith (Core). I definitely consider running this one in my Targ deck, which runs not a single Lanni card. I can "filter" the 1 gold cost of this location pretty easily since it runs a lot of allies like Shadow Seer, Dragon Knight and Dragon Thief - and the rounds after it might actually serve as an income boost. All this while providing influence which my, and many other Targ decks, always need. With the unrestriction of pentoshi manner, seeing this as a must for targ burn right now.